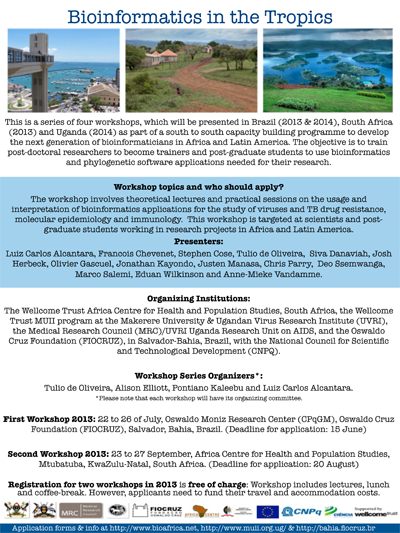 This is the second workshop of the bioinformatics in the tropics series, which will be presented by the Wellcome Trust Africa Centre for Health and Population Studies at K-RITH at the University of KwaZulu-Natal, Durban, South Africa, 23 to 27 September 2013. The bioinformatics in the tropics series is part of a south to south capacity building programme to develop the next generation of bioinformaticians in Africa and Latin America. The workshop involves theoretical lectures and practical sessions on the usage and interpretation of bioinformatics applications for the study of large data sets of HIV genomic data. This workshop will be focused on the statistical analysis of HIV drug resistance and phylogenetic inference and interpretation of large trees. This workshop is targeted at scientists and post-graduate students working in drug resistance and molecular epidemiology research projects in Africa. Please download the application form here!!!. Luiz Carlos Alcantara, Francois Chevenet, Stephen Cose, Tulio de Oliveira, Siva Danaviah, Michelle Gordon, Josh Herbeck, Olivier Gascuel, Jonathan Kayondo, Justen Manasa, Chris Parry, Deo Ssemwanga, Marco Salemi, Eduan Wilkinson and Anne-Mieke Vandamme. - The Oswaldo Cruz Foundation (FIOCRUZ), in Salvador-Bahia, Brazil, with the National Council for Scientific and Technological Development (CNPQ). Tulio de Oliveira, Alison Elliott, Pontiano Kaleebu and Luiz Carlos Alcantara. Registration for two workshops in 2013 is free of charge: Workshop includes lectures, lunch and coffee-break. However, applicants need to fund their travel and accommodation costs.